American Idol's first lady of pop, Kelly Clarkson, released the video for her latest single, "Dark Side," on May 24th to her official VEVO page. Shot in Los Angeles at the end of April, the video was directed by Shane Drake ("Stronger (What Doesn't Kill You)") and features actors portraying several sad and depressing scenarios including unemployment, body image, war, divorce and bullying. 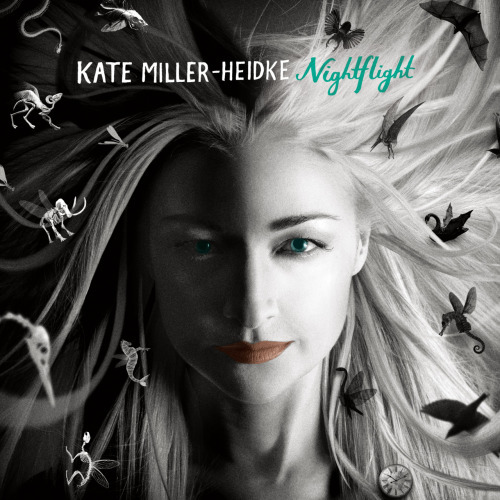 Australian singer/songwriter Kate Miller-Heidke has announced the U.S. release of her third album (2nd in the U.S.), Nightflight, due out June 19th. The Aussie talent first caught my attention with her unusual, yet alluring art for 2008's Curiouser. In the stunning artwork (BELOW), Miller-Heidke stares straight out, a gilded clock nestled in her coiffed hair, which is piled high in a semi beehive/pompadour style (a la Amy Winehouse + Marie Antoinette), dramatic red lips, a black scarf tied round her neck and bare shoulders. Wickedly stunning.